(3:10 p.m. EDT) -- Award-winning Spanish artist Eduardo Arranz-Bravo has been chosen by Norwegian Cruise Line to design the hull of its next new ship, Norwegian Encore, slated to launch in Miami in November 2019. 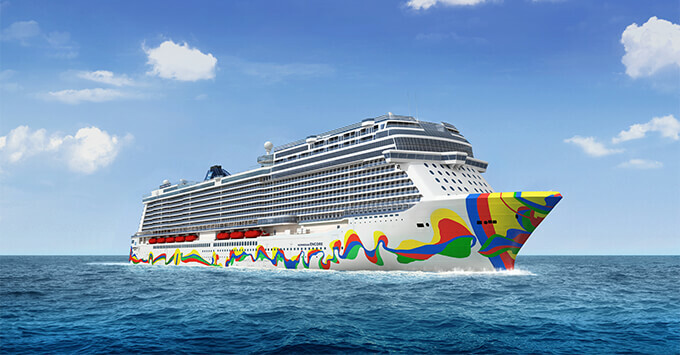 The fourth and final ship in Norwegian's Breakaway Plus class -- which also includes Norwegian Escape, Norwegian Joy and Norwegian Bliss -- will feature a colorful, abstract-designed hull, inspired by Arranz-Bravo's life by the sea in Barcelona. The artist's paintings also can be found on ships belonging to the line's sister brands, Oceania Cruises and Regent Seven Seas Cruises. "Eduardo's design will be a perfect complement to the collection of hull artwork within our fleet and is a testament to the dynamic experience our guests will have on board," said Andy Stuart, president and chief executive officer of Norwegian Cruise Line. "We are proud to welcome him to our Norwegian Cruise Line family." Arranz-Bravo is known for his inventive and humanistic approach to abstract art. His work has received numerous awards and accolades; he also was one of three artists chosen to represent the 1992 Olympic Games in Barcelona. Norwegian Encore, now under construction at Germany's Meyer Werft shipyard, will have capacity for nearly 4,000 passengers and boast many of the features found on its sister ships, as well as a few of its own. Few details of its itineraries have been released, other than the fact that it will sail the Eastern Caribbean during its inaugural season.